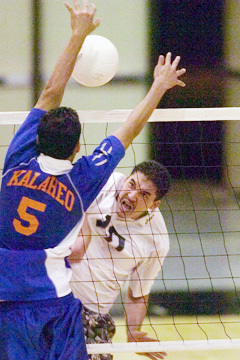 Kalaheo's Chris Tumaneng tried to block a shot by Radford's Billy Nihipali during last night's match. Take the best that the big blue machine had a year ago, add more firepower in the middle, and win another Oahu Interscholastic Association boys volleyball championship. It's almost unfair. Kalaheo captured its second league crown in a row, sweeping previously unbeaten Radford 25-14, 25-18 last night at McKinley Student Council Gymnasium. Mana Guerreiro pounded eight kills and two service aces, and Elias David tallied seven kills and an ace to lead a balanced Mustang attack. Junior Tyler Caswell added seven kills and a roof to solidify a multiple attack directed by senior Chris Tumaneng. Kalaheo (12-1) earned the OIA's top seed for next week's Division I state tournament. Radford, ranked eighth in the Star-Bulletin Top 10, had an amazing run through the OIA with 14 consecutive victories. Anthony Babas led the Rams with six kills. The Rams, coached by 21-year-old Damon Reyes, had not faced a team quite like Kalaheo until last night. Tumaneng was masterful, dishing sets to an array of Mustangs from a variety of angles. Caswell, a 6-foot-5 middle, and teammate Chase Moses were often unchallenged on swings over the middle. "You can't concentrate on just two guys anymore," David said. "All of us improved so much since last year. All the underclassmen are older, and a lot more guys played club ball." Leoni praised his setter for excelling in an offense that added more wrinkles this season. "The offense is more refined and Chris really stepped up," he said. Currently ranked fourth in the state, Kalaheo's rise to volleyball prominence under Leoni is well recognized by fans. "It feels good to be complimented, but we try to stay as humble as we can at school. We'll take this as a win and move on to states." Leoni agreed about Kalaheo's relatively calm post-match celebration. "From the beginning of the year, in my head, states is a bigger goal. It's no secret; we'll have better competition there," the former UH player said. The Mustangs, ever confident and enthused, started the match at full-bore intensity and kept it humming. "In the past, we've struggled at the beginning of games, giving up a five- or six-point lead," Leoni said. "It was really important to come out with intensity, especially against Radford. We were definitely focused." The Rams were within 8-7 after a kill by Billy Nihipali. However, David took command with three kills and an ace. His serving was a factor, forcing an overpass that led to an easy kill for Chase Moses. After David's onslaught, Kalaheo led 13-7 and never looked back. Guerreiro sealed off any lingering hopes for a comeback by Radford, finishing the set with three aces and two kills. Tumaneng used an arsenal of weapons, relying on Caswell and Moses in the middle to diversify the Kalaheo attack. Moses and Caswell combined for five kills in the opening set. Radford regrouped and stayed with Kalaheo in the second set. A roof by Allan Babas helped the Rams rally to a 6-all tie, but the Mustangs went on a 7-2 run. Kills by David and Guerreiro, along with an ace by Tumaneng, gave Kalaheo a 13-8 lead. Radford summoned another comeback, pulling within 17-16 after a bunch of Kalaheo errors. However, the Mustangs finished off the Rams with an 8-2 blitz for the win.